2 double bedrooms, lounge/ diner, shower, sleeps 5 people. Balcony . Our private holiday rental in Protaras comprises two bedrooms kitchen / lounge shower room / WC and is fully furnished with air-conditioning throughout (inclusive). Benefiting from the use of satellite TV, WFI and off street parking. 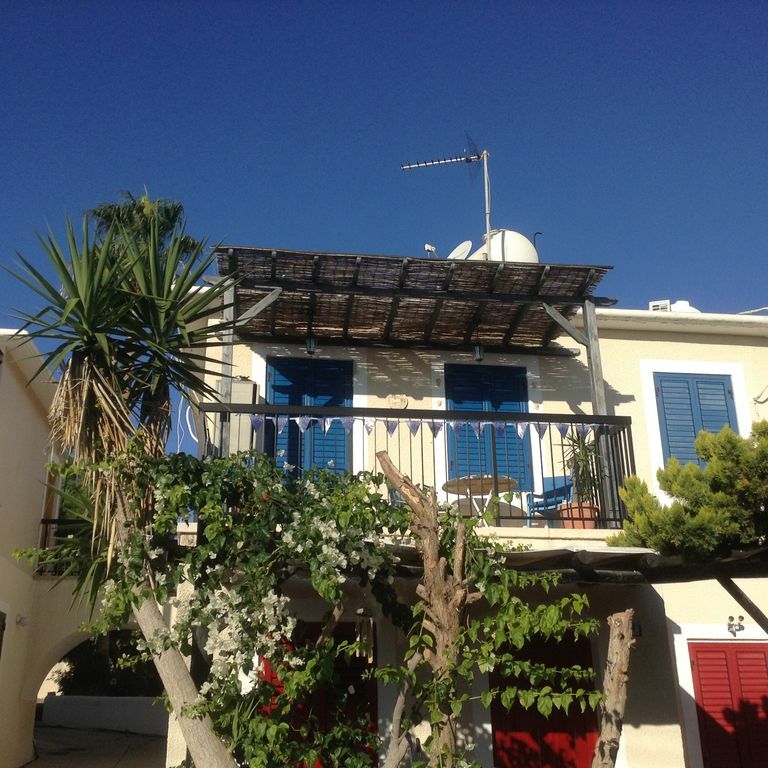 As a holiday rental is ideal for families seeking self-catering in Protaras .The private balcony overlooks the famous church at Profitis Elias, (illuminated at night) and Fig Tree Bay Protaras. Sea View Cottage Protaras is ideal for wedding guests honeymooners, families and those seeking a winter break.Warm summers, mild winters. Walking distance from all the amenities and arguably the best beach on the island yet set back behind the church away from the hustle and bustle of the resort to ensure a good night sleep. View to die for. The apartment is fully furnished. We have maintained the apartment to a high standard and would ask our guests to respect this. The apartment was very tidy and had all appliances and even some extras. It was good to see coffee and tea and milk and water to wait for us. It had many things that other owners don't bother to add in their apartment. But the apartment was very small for a family of 5. The living room had a 3 seat sofa which was not enough for a family of 5 to seat. I know that there were also chairs but nobody can seat on a chair to watch television. If I am not mistaken I don't remember for sure when I booked it from owners direct I think it was showing sleeping 6 persons. That also was not valid since the sofa is very thin and in general the apartment very small. This was a clean and well decorated apartment with homely touches. We had everything we needed for a family of four to live in comfortably for the holiday, including to cook and wash. We especially enjoyed being able to eat meals and relax out on the balcony.The location was ideal for us, quiet but near enough to get to the shops,cafes and beaches. A charming apartment overlooking Protaras & the sea beyond. A well presented apartment located on the hill just outside the main area of Protaras. Very easy to find with excellent directions & pre arrival information & communication from the owners. We stayed for a week in mid November & went to the beach every day (did get windy in the afternoon & was dark by 5pmh) It was our first trip to Cyprus & we were impressed with the lovely beaches (Konnos Bay, Fig Tree) in the local area. Only a short drive or bus to Ayia Napa & more fab beaches (Nissi)... Great base for exploring or staying local. Lidl store 5 mins drive & kitchen well equipped if self catering. Lots of bars &'restaurants in Protaras (10 min walk) - most were closed as it was Winter but local restaurant 'Nameless' open all year & excellent home cooked food & great cocktails in local bar at the bottom of the hill on main road. This property is absolutely located at the right spot. Just off the touristic area but close enough to walk down. Nice apoartment with all facilities needed for a comfortable stay. This apartment is everything you need for your stay in Protaras! Clean and comfortable with a fantastic view!! We had a car which made everything even easier to access but even without everything is within walking distance! Which is ideal! Fantastic beaches all with in 10 minutes! Beautiful surroundings, fantastic food near by! Already looking at booking again! Our family of four has just returned from a wonderful break, staying here in this quiet part of Protaras, close to the impressive St Elias church. The property was as described on the website, very comfortable and clean, everything was in good working order and the rooms were very tastefully decorated - with many artistic touches. The owners could not have been more helpful in providing us with many tips on local facilities and restaurants. Even in early April it was warm enough to enjoy a leisurely brunch on the balcony, taking in the scenic views across to Fig Tree Bay. There was a good choice of restaurants in the central area of Protaras and on the sea front which could be reached easily on foot. It is an easy 40 minute drive to Larnaca airport and we reached Nicosia in just over an hour by car. park area around Cap Greco - to Konnos Bay and beyond in one direction and past fantastic sea caves in the direction of Ayia Napa in the other. The views were breathtaking and the wild flowers at this time of year were a treat to behold. Will definitely wish to make a repeat visit and would recommend this apartment highly to other families. Protaras is situated in the region of Famagusta. Larnaca airport is a 40 minute drive. The area is serviced by motorways giving easy access to the rest of the island. Other Activities: A full range of water sports at Konnos Bay. Guest can enjoy excellent cuisine at the international acclaimed Blue Spice Restaurant. NB: From July 23- Sept 2 2011 holiday bookings arranged mid week carry a 10% surcharge per week. Long lets from November 2010- to the end of March 2011 qualify for discounts depending on the length of the tenancy. We will accept bookings for less than seven days but there is a minimum cover charge of £150 We can also provide transport including car hire at competitive rates.